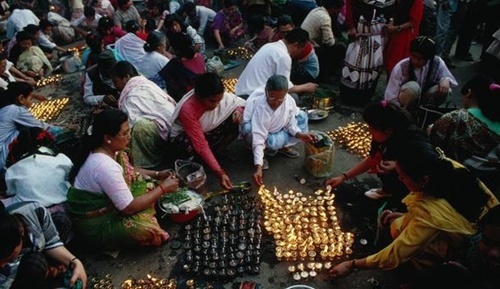 As most of you already know Nepal follows a different calendar than the Gregorian calendar so Nepali New Year falls on mid April instead of 1st of January. Bikram Sambat or Nepali Calendar or Nepali patro is approximately 56 years and 8½ months ahead of the Gregorian calendar. Unlike Gregorian months, the lengths of Nepali months are not predetermined, and change from year to year, varying from 29 days to 32 days. This year starting today is 1st of Baishak, 2069. 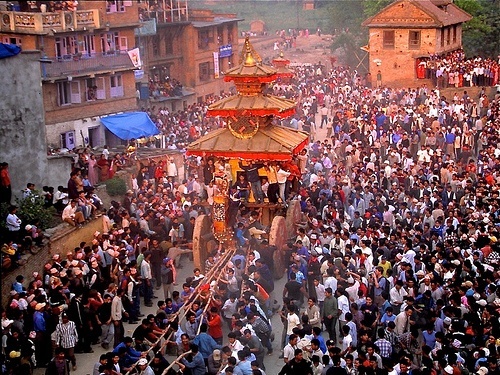 There are lots of celebrations for Nepali New year in Nepal but the most important one is a nine day long Bisket Jatra is held in Bhaktapur, which is 15 km east of Kathmandu. 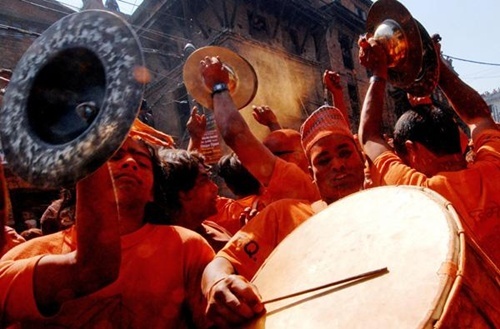 It is considered one of the liveliest cultural festivals in the world. There is a legend that every man who married a Bhaktapur Princess died the first night. So, one brave prince after marrying the princess, stayed awake on the first night. He saw two serpents come out of the two nostrils of the princess when she was asleep. The prince quickly took out his sword and chopped off the serpents’ head . The next morning, the serpents were displayed on a pole in Bhaktapur and this continues till today in the form of Bisket Jatra Festival. 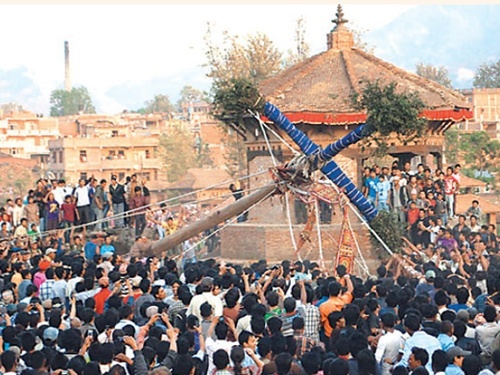 So on the first day of Bisket Jatra, a symbolic 25 ft Yoshin-Pole is erected in Taumadhi Tole of Bhaktapur. Two days after the erection of the pole, the idols of Lord Bhairab and his female counterpart Bhadrakali are enshrined in two large chariots and pulled through crowds of cheering onlookers. When the chariot reaches a sloping open square, there is a tug-of-war between the inhabitants of the upper and lower parts of the town. The winners of the tug-of-war are considered blessed with good fortune for the coming year. 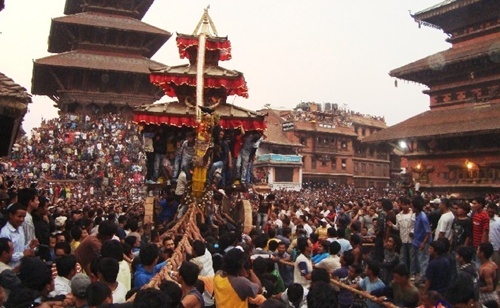 On the last day of the festival the Bhairav Chariot is parked in Gahi Tole. At midnight the smaller Bhadrakali Chariot is repeatedly rammed against the Bhairav Chariot in a not very subtle display of their explosive copulation. 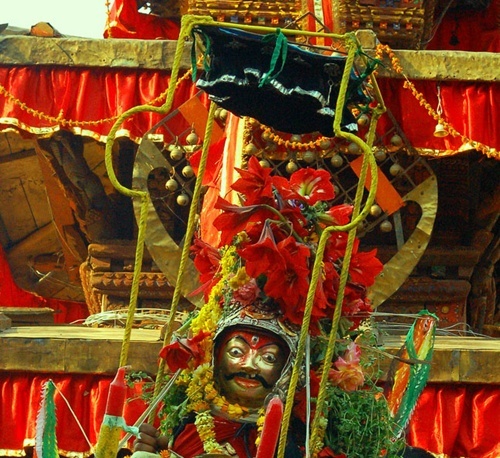 Variations on the Bisket Jatra theme can also be seen in the villages of Thimi and Bode. In the former there’s a parade of images of the gods, with villagers throwing red powder over them. In the latter, there’s a tongue-piercing ceremony, with one villager spending the day with an iron spike piercing his tongue. Apart from this, there are lots of dance parties organised in Kathmandu this year to welcome the new year. In Sydney, tomorrow (14 April) we are going to celebrate new year with the Nepali band Nepathya. They are performing live in Sydney’s Town Hall. I’ll update about the event later. This entry was posted in Nepal, Nepali Festivals and tagged Bisket jatra, Nepali new year. Bookmark the permalink. Happy New Year!! I love the pictures, your culture is so diverse!! I hope so too gurl 🙂 bless you! I’d actually like to see Mt 88 (or something) and Sabin rai live. That would be cool! Happy New Year — have lots of fun! Happy New Year! I love Nepali festivals! I was so lucky to be there for the Festival of Lights! It was so amazing and put us here in the US to shame. I wish we celebrated like you do! What is the starting point for the calendar? Is there some originating event? The Bikram Sambat was started at the beginning of the Licchavi period after King Bikramaditya due to his contribution of starting new solar calendar .